Today’s Janathon effort was a ‘shop and drop’. These usually occur several times during an Athon and come into play when I need both exercise and groceries. Basically, we go and do the big shop at Tesco, Ginge throws me out at the side of the road and I run home. Tonight I did the shopping in my kit (hi-vis vest in handbag, I’ve got to have some standards) and was chucked out with a couple of miles to go. Miles was having one of his sulks at being asked to find satellites (either because it was cloudy or because I was standing next to a tree) but eventually we both got our act together and legged it back in time for tea. This was not the only shopping that I have done in the past 24 hours. 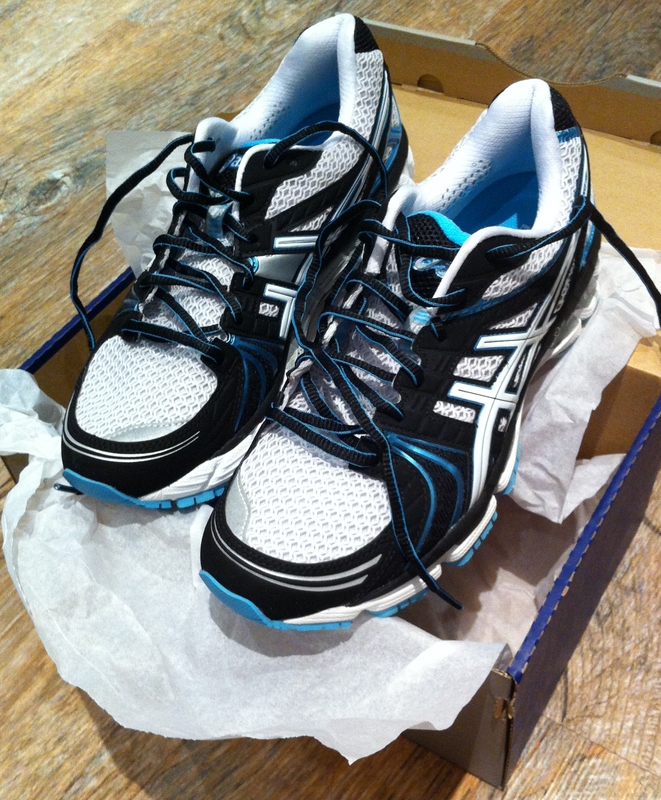 My beloved Asics Kayano 18s were half price at Sweatshop this weekend and the Telegraph were doing a £10 voucher as well, so it seemed rude not to invest in a pair for when my current shoes give up. Unfortunately, I was given an education in the difference between ‘a sale’ and ‘an offer’. It turns out that I couldn’t use the voucher for my trainers because they were on offer, rather than being in the sale. Still it was an offer I couldn’t refuse. The Telegraph also had a voucher for Women’s Health magazine, which went into the trolley tonight and will probably cause me to curse and mutter dark oaths under my breath from cover to cover. So that’s week one of Janathon completed and 21 miles done! Ain’t small print grand! Nice shoes though. I’d get my OH to drop me off on the WAY to Tesco as I hate food shopping at the best of times! Being dumped and running home are the best runs. Every step nearer the end! I used to love Women’s Health mag until I started running, and I realised that it doesn’t matter what sort of healthy fad I follow, the ONLY thing that actually makes me lose weight and tone up is going out running. Like you idea – does it mean the shopping is all put away as well by the time you get home? Half – but tea was ready and that’s far more important!